A team of eco-tourists was in Aitutaki last month for the Aitutaki Lagoon Monitoring Project, a combined research and eco-tourism project run by local organisation, the Pacific Islands Conservation Initiative (PICI). Eight people took part in this four-week project and surveyed 22 sites within the lagoon, inside and outside of ra’ui. The team measured coral and algae cover as well as fish and invertebrate (e.g. 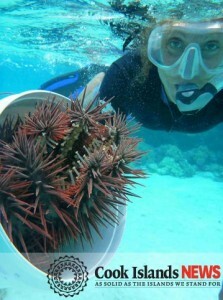 sea urchins, paua) populations to compare with environmental data. Team members also checked beaches for sea turtle nests. In general, the number of fish was highest in the southern part of the lagoon, and high numbers of paua were only found at two sites within ra’ui areas. There were few adult parrotfish inside and outside ra’ui, but the good news is that high numbers of juvenile (young) parrotfish were encountered at most sites. Coral cover was highest in the south-western part of the lagoon, where the team also found the clearest water. A report with a more detailed description of the results will be presented to the Aitutaki Island Council and Ministry of Marine Resources to help them manage the lagoon environment. Team members had the privilege of sharing their work and some of their surveying methods with students of Araura College and primary school, having been invited by teacher Rere Mataiti and principal Gene Bartlett. Several of the students tried out SCUBA equipment for the first time. The group also cleaned Akaiami’s beach (collecting over 30 bags of rubbish, including 735 plastic bottles), while staying at Gina’s Beach Lodge on Akaiami. The Aitutaki waste facility waived the landfill fees; PICI thanks Ngatupuna Ruarangi for this. 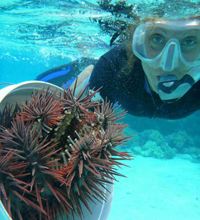 The team members removed five crown of thorn starfish (Acanthaster planci) from the lagoon because they are known to cause damage to the corals. This expedition was the first in an ongoing series of expeditions aimed at bringing eco-tourists to the Cook Islands. Etu Moana Resort and The Boat Shed provided support for the project and made the team feel welcome. The establishment of the Aitutaki Lagoon Monitoring Project has been made possible through assistance of the Destination Development Fund.